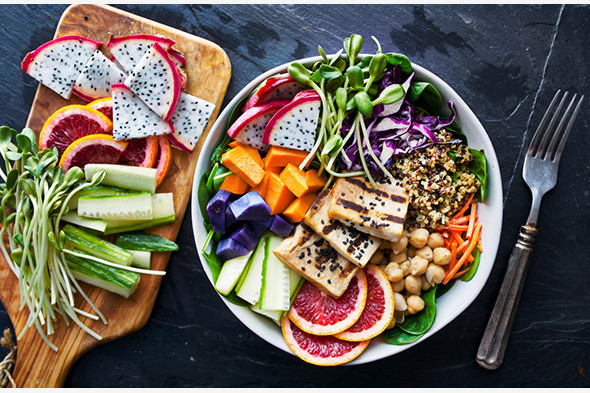 Buddha bowls, sometimes referred to as hippie bowls, are hearty – and heart-friendly – all-in-one dishes made of a variety of greens, raw or roasted vegetables, a serving of protein, and a healthy grain like quinoa or brown rice. They are often topped with crunchy nuts or seeds and layered with some kind of sauce or dressing for added flavor and texture. There is plenty of room for improvisation when it comes to Buddha bowls but the basic formula stays pretty much the same. It’s a meal-in-a bowl dish that is filled with vitamins and nutrients, and it has become one of the biggest trends of the year. Who Launched the Buddha Bowl? Why Are They Called Buddha Bowls? Today, the Buddha bowl has picked up steam as one car in a train of trends that emphasize healthy living and that lean towards whole grains and plant-based foods. Also, you can’t knock the convenience of an all-in-one meal. Finally, there is, as Lein says, the Instagram factor. Given the colors and textures of the foods in a Buddha bowl, they are perfect subjects for a spectacular photograph, and many wellness fans can be spotted snapping photos of their vibrantly hued lunches and showing them off on their favorite app. Leftover or fresh; steamed, roasted, or raw; every type of vegetable can be included in a Buddha bowl. The more colorful the better so consider diced roasted sweet potato, steamed broccoli, or roasted rings of orange squash. Raw veggies also add texture, so try grated carrots, kohlrabi or beets; thinly sliced purple cabbage; shelled edamame; zucchini ribbons, and so on. Anything goes and in any combination. 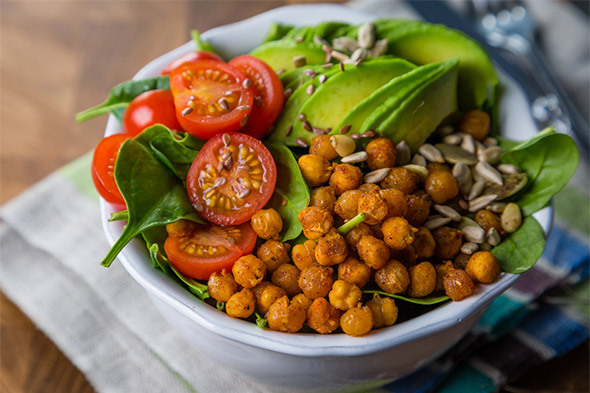 For vegans, lentils, canned kidney beans, and chickpeas are usually included; but Buddha bowls have come a long way since their inception and it’s okay to add diced chicken or cubed salmon to the mix, as well. For a pleasant change of textural pace, sprinkle on seeds or nuts: pumpkin seeds, chopped almonds, walnuts, pistachios, or cashews are just what your bowl is looking for. Finally, to keep the whole thing from being too dry, dress your Buddha bowl with a drizzle of vinaigrette, a splash of tahini sauce, or any dressing that your heart desires, and your imagination comes up with. And there’s your Buddha bowl – ready to be devoured. Are They Just Revamped Grain Bowls? 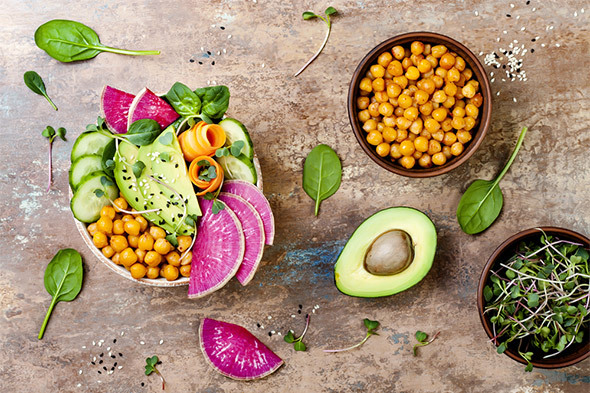 No matter what you call your bowls of goodness and color – Buddha bowls, grain bowls, hippie bowls, sunshine bowls, or glory bowls – the bottom line is grains, vegetables, protein, and toppings, all combined in a bowl, make for the perfect, healthful meal that is trendy and delicious at the same time. Snap a photo and add it to your Instagram account, or just scarf it down and leave the pics to others; either way, this meal-in-a-bowl is a trend that’s here to stay. This entry was posted in Food Guides, Health and Safety and tagged buddha bowls, health, healthy, healthy food. Bookmark the permalink.